The San Clemente-famous suds land at Sand Canyon Plaza. The San Clemente-famous suds land at a new Sand Canyon Plaza location. IRVINE: The brewhouse debuted in early summer, and it has a number of Left Coast classics on draft, including Hop Juice Triple IPA, Trestles IPA, and Asylum Belgian Style Tripel Ale. As for a totally new libation, one that will be brewed in Irvine? Prepare your tastebuds to be tantalized by the Smoked Saison, "the very first beer brewed onsite in Irvine and an ode to smokehouse cuisine." Interesting stuff, as is the fact that there are several vittles to order and pair with what's in your glass. Barbecue is one theme, as are "classic comfort dishes," and "specialty mac-n-cheese loaded with smoked pulled pork" will surely be one popular complement to the fancy foams. TO EYE THE BEERS, the menu, the location, and all of the hearty 'n hopsy Left Coast spirit, visit the site for the newest Irvine brewery, which, by the by, also includes a distillery. 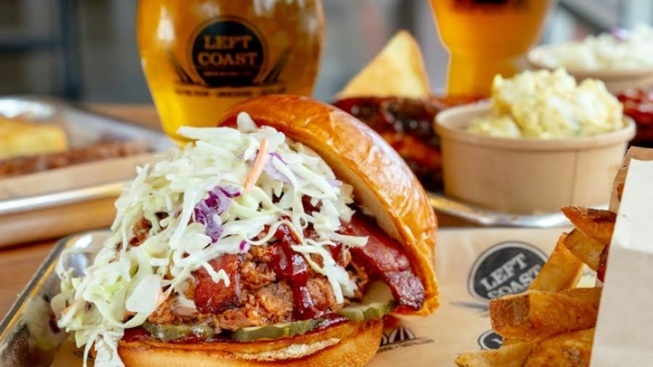 Now Left Coasters have two locations, not too far apart, to find a beer, something flavorful, and that quintessential crafty California experience.